Google is making its local-search service available to mobile-toting users, offering maps and driving directions optimised for the wee screen. The nifty service – currently being publicly tested – lets nomadic users find local restaurants, stores and other businesses using their Web-enabled mobiles/PDAs equipped with suitable XHTML (Extensible HTML)-enabled browsers. Using the service is simplicity itself, with a simple interface offering two boxes to enter “what” and “where” search terms, a search button and a link to get driving directions. If you’re gasping for a Budweiser beer in Brooklyn, simply type ‘bar’ in the first box and the area’s zip code in the second and you’ll be presented with a helpful list of ten hostelries, with a ‘next’ button offering more locations. Each search result offers the name, address and phone number of the bar and the distance from your location (sadly the service is currently only available for US and Canadian services). As with Google local search results, clicking on the link for a result takes you to a page offering more detail about the business (there’s not much there at the moment, though). Telephone numbers are displayed as a hyperlink, and if the users’ phone supports the facility, clicking on the link will dial the listed telephone number (unlike some local search services, there is no additional charge for this). 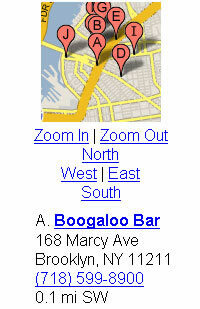 At the top of the page, a small map shows the locations of the bars listed, with each marked with a pushpin-like icon. A set of text links below lets you zoom in and pan around the local area. Basic driving instructions can also be obtained by inputting your start and end addresses. Naturally, such a genuinely useful service suggests a host of revenue earning possibilities, but Georges Harik, director of product management for Google declined to discuss future plans for sponsored listings, pay-per-call advertisements or other potential enhancements to the local mobile service. Instead, the cryptic chappie stated that Google “plans to do whatever would be useful” for users of the service. Local search services are set to be the big hot potato of 2005, with the Kelsey Group reporting that local search ad spending hit US$162 million (£85m/€125m) in 2004. The local advertising market is predicted to reach US$5.1 billion in the United States by 2009, with local search advertising accounting for about two-thirds of the spend. With Google’s arch-rivals, Yahoo, already offering a mobile search service, we can look forward to a glorious bun fight as the search engine giants ramp up the feature sets to woo customers. Bring it on!